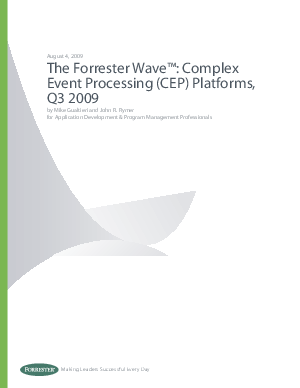 Forrester Research has named Apama as a standout leader in the complex event processing (CEP) platform market in The Forrester Wave: Complex Event Processing Platforms, Q3 2009 Report. The Report evaluated nine CEP platform vendors based on a comprehensive set of evaluation criteria. Apama excelled in every area: .Current offering: Apama's development tools, event processing features and runtime architecture garnered stellar marks. .Strategy: Forrester found Apama to be backed by strong corporate and product strategies. .Market presence: From installed base, to services, revenue and systems integrators, Apama led the pack.